We took down the fence between the two broods and they are gradually adapting. Organising the pecking order was a little brutal to be honest, but it’s the hens lower down who do the damage: the top hen is secure. Although I perceive a slight adjustment even there – I suspect Dorcas, who has been top hen from the beginning, is now second to Delilah … so it’s Deanna who is throwing her weight around among the various bantams … and it’s the second Moppet that is challenging the Mille Fleur at any given opportunity. Are you following me?! 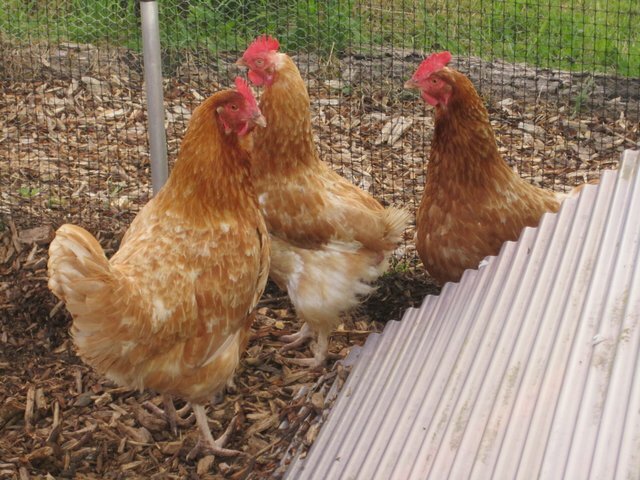 The LS bantams were the first to take themselves off to the Cube to join the older girls for the night – but only after a few evenings of removing them from the top of the shelter once they were settled. They preferred to sleep there rather than in the little coop with the MF, and were perfectly safe there, but not yet having had any experience of rain, they were clueless as to what to do if it rained overnight so we moved them. As the new girls began to show signs of laying – their comb getting brighter, and crouching – we began to take the back off the Eglu Go, so they had to go and share the nest box in the Cube when they wanted to lay … there were a few spats, and one bloody comb (never did work out whose), but it didn’t take long before we were having an extra egg or two a day. We put the back on at night, so the newbies still had a safe place to sleep, until one morning we realised they hadn’t slept in the Go at all. So now the back is off altogether and the Go is simply a shelter and feed station. I suspect there are still a few shuffles going on in the pecking order (PO), primarily between Dorcas (new girl, Cou-Cou Maran) and Carey (old guard, Buff Sussex). 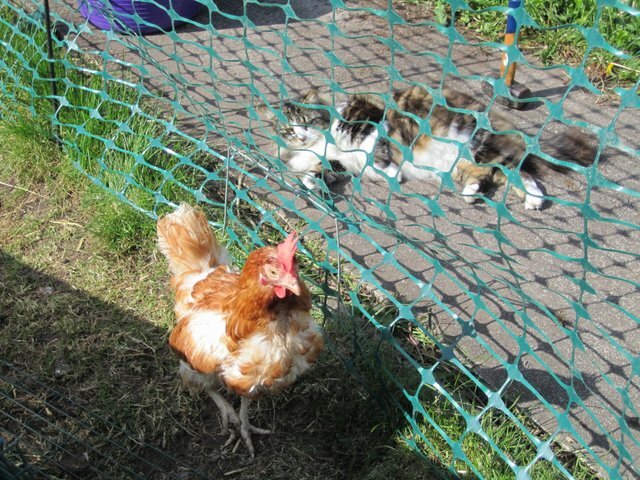 But generally it’s gentle in the hen garden, that is until they see me coming. The new girls associate me with treats and come running. Carey, with the wisdom of age, waits to see if I’ve actually brought something with me, before disturbing herself – she’s clearly feeling her age as she is usually settled somewhere quietly, rather than actively engaged in foraging etc. 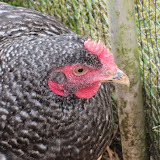 But they will all feed from my hand – I’ve taken to wearing gardening gloves since six hens coming at you from all angles is rather daunting and one or two of them peck hard (Dorcas among others)! Even the Moppets get stuck in … as does Delilah (new girl, Light Sussex) though she is towards the bottom of the PO, perhaps even below the Moppets. We have finally moved one more raised veg bed. 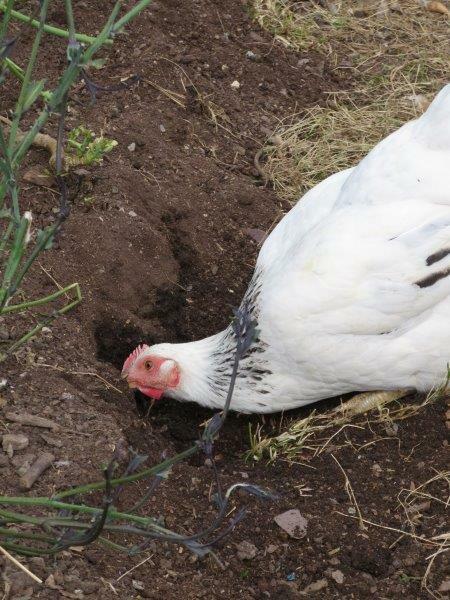 Once the frame was moved, it was a race against time to move the soil before the hens spread it everywhere by digging into the freshly exposed tilth … the photo is Delilah working away at a hole she dig all by herself – it was eventually almost as deep as she is tall! 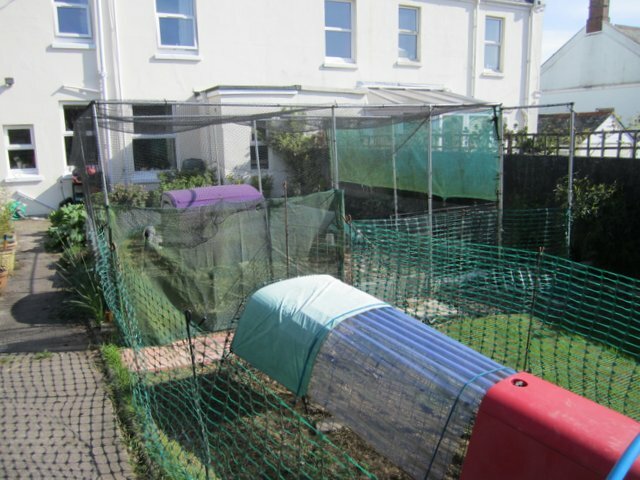 I’ve taken the risk of raking the space over and sowing grass seed … it’s covered with mesh, but the girls can still pick at the seed if they choose, although they can’t scratch it up. Some of the seed will germinate … as I discovered when I moved the Go … so it will be worth it even if we only get a sparse covering. Once the run is pitched on one of it’s permanent sites, any new growth can continue undisturbed for a few months until the electric fencing is moved again. 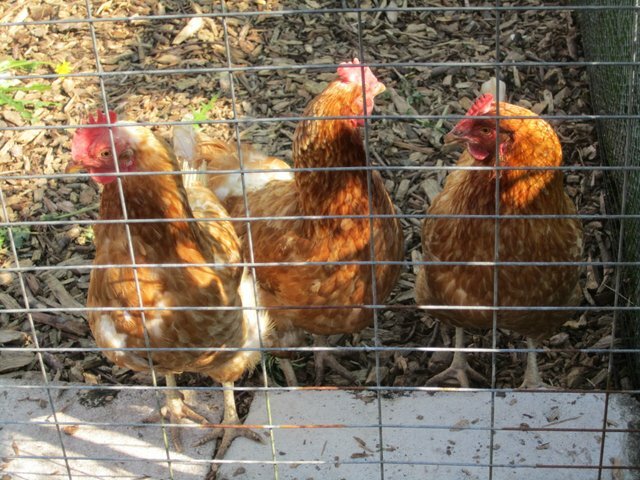 I hope to have at least two if not three ‘pitches’ we can use, to give the ground a rest from time to time and to be able to keep the hens on grass most of the year. It’s much better for them than wood chip. 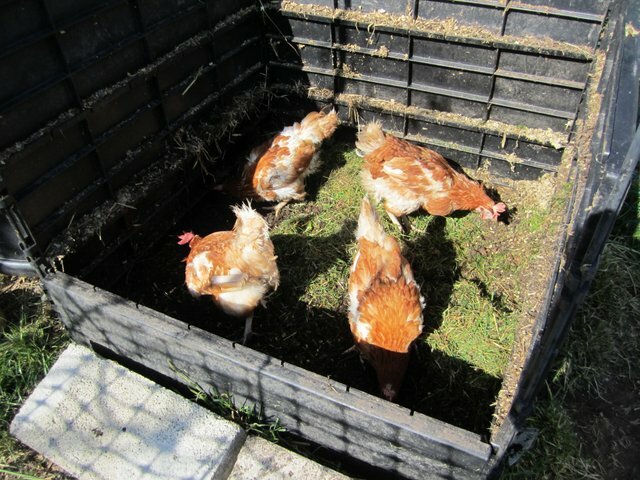 I’m also hoping to give the girls some cover by planting some shrubs they can root around and where they can find some shade, as well as splitting one of the raised beds into smaller units for use as a dust bath. 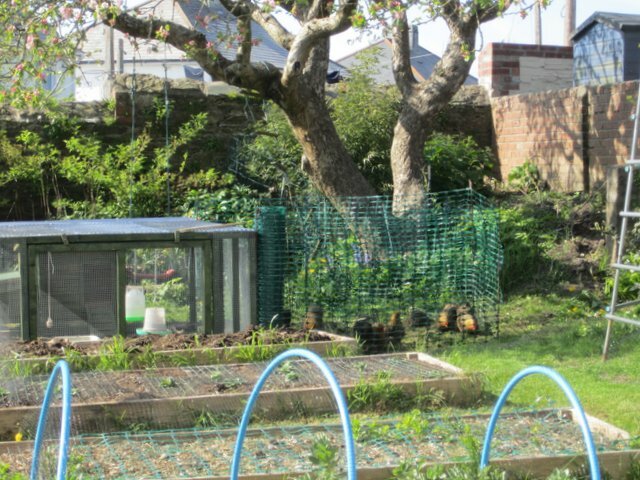 The long term plan is to open up the garden, so that the hens can move to fresh ground from time to time as well as being more visible from the house. We’ll still have the toolstore in view which is a bit of an eyesore, and which will kill off the grass … but that’s a small price to pay for the benefits – not least the exercise we are getting with all the digging and weightlifting we are doing to make it happen! 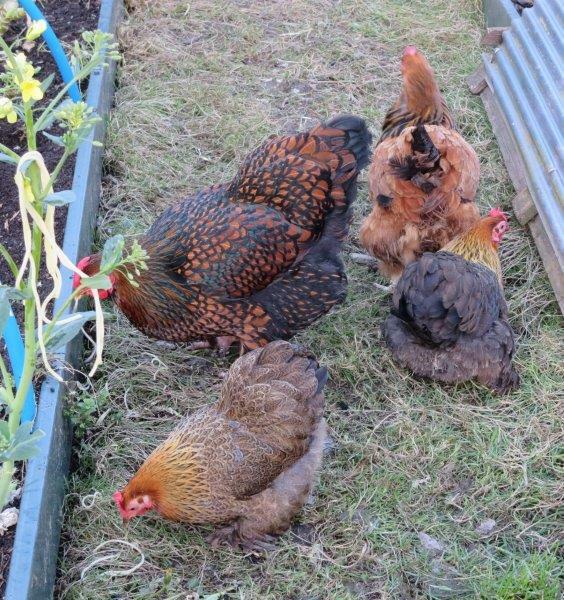 The old girls all together, just before we moved the raised bed. Five down, one to go! Integration Day 2/3 – complete! Next day, when we were once again in the garden, we opened the gate between the two broods. I sat in a corner with a pocketful of corn, and there were plenty of greens and dandelions scattered around. There were a few spats between the girls, but enough distractions that none lasted long. I sat there for some time, simply watching. I could see which hens gave way to whom, who decided to stand fast, and which of the girls avoided all contact. Betsy still isn’t well and kept apart for the most part. As we’ve seen before with a poorly hen, others would come and keep her company but the distractions were too appealing else they may have spent longer with her. After a while, a pecking order became apparent … four of the Five on top, in their normal order, and Camilla at the bottom (not counting Betsy) … poor Camilla. We realised it wouldn’t be as easy a second night to separate them … so I threw a handful of corn in the Hen Run, and closed the gate on all nine hens 😮 I went out just after dark to check all was well, and found five hens in the nest box – three ex-batts, Camilla and Clare – the other on the roosting bars. This morning, confined to the run, they are mostly content, with only the occasional, short-lived friction in evidence. So that’s it … full integration in only two days 🙂 I’m astonished. There are signs that Carey may not survive as top hen, but it’s all very subtle … I’ll keep watching and let you know! Hmm … well, it seemed like a good idea at the time! I suspect that, as bottom hen of the Five’s pecking order, Clare intends to dominate the Girls in order to move up the hen hierarchy. Betsy was the first to get involved simply because she’d wandered away from the other Girls … she’s not in good health so is often on her own. I hope integrating the two groups won’t cause her too much stress. It was a moment’s impulse to swap the broods round … the Five were all in the Moppet House and it was easy to shut them in while herding the Girls into their old home in the Hen Run. Hopefully they will still remember the Cube as home and find their way to roost at dark. I wonder if the Five will discover the coop as easily? I figure it will confuse them all as to territories, and might eventually make integration easier. You can hope, can’t you?! Everyone is very happy where they are. But we can’t continue to run three separate broods for long. It’s a lot of work each morning to clean three coops and top up three different sets of drinkers and feeders. And it wouldn’t be fair on our lovely chicken sitter. 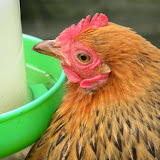 Nor can we leave hens in the greenhouse all summer as it will get far too hot. The Moppet House isn’t water-tight, nor is the wooden coop, but it will do as a summer house for a small brood who could then over-winter in the greenhouse. But exactly which hens? 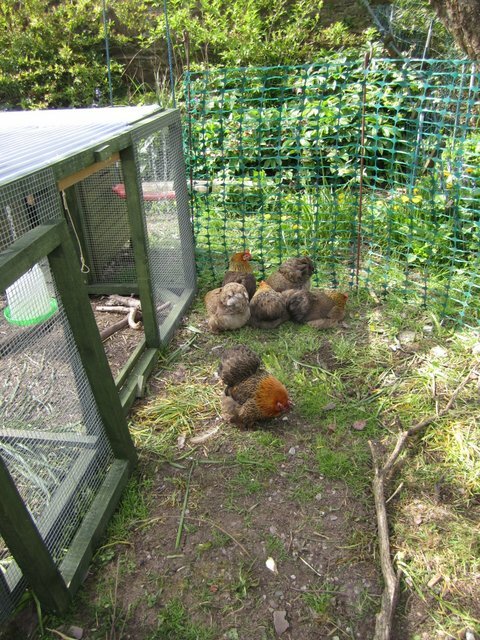 Although the Famous Five in the Hen Run, and the Vicarage girls in the Hen Garden/Moppet House are neighbours with only a mesh fence dividing them (actually there are three layers … plastic mesh plus chicken wire plus shade netting), we don’t see much by way of chest bumping, although there has been the occasional show of aggression. But one of the ex-batts continues to ail (Betsy – although her feathers are slowly returning, she isn’t showing any signs of improvement in her stance) and one of them, Babs, is severely underweight. Would that be a good combination? The Moppets are feisty birds (and by the way, the broody season has begun ) so could stand up for themselves. They would pose less of a threat to the Famous Five, but I wonder whether they’d struggle to reach the Cube to roost? There’s be plenty of space since they’d almost certainly sleep in the nest box. As they are, the Famous Five have sufficient space in the run by themselves. But add in any more birds and we would need to allow them more space somehow. 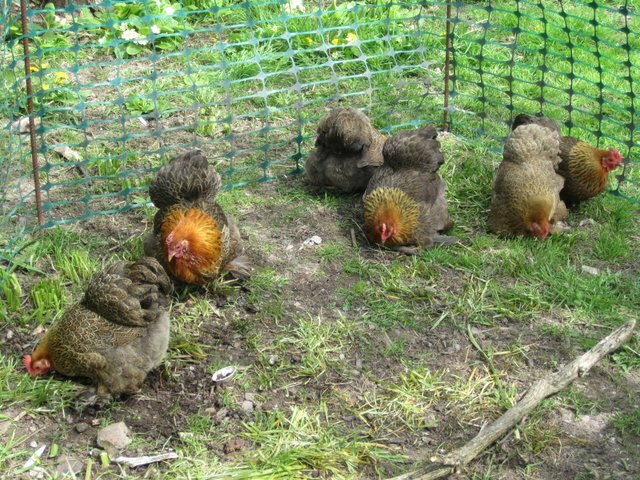 The bantams really need to be on grass, but the Hen Garden is now down to woodchip and there isn’t a lot of grass left on the other side of the path, either. If we were to lose any of the ex-batts or bantams, we still have the Eglu we can use as housing for two or three birds, just to add to the conundrum. The new girls seem a bit distracted to the right of the run … what are they looking at? Magic isn’t really interested, but they keep a watchful eye all the same. 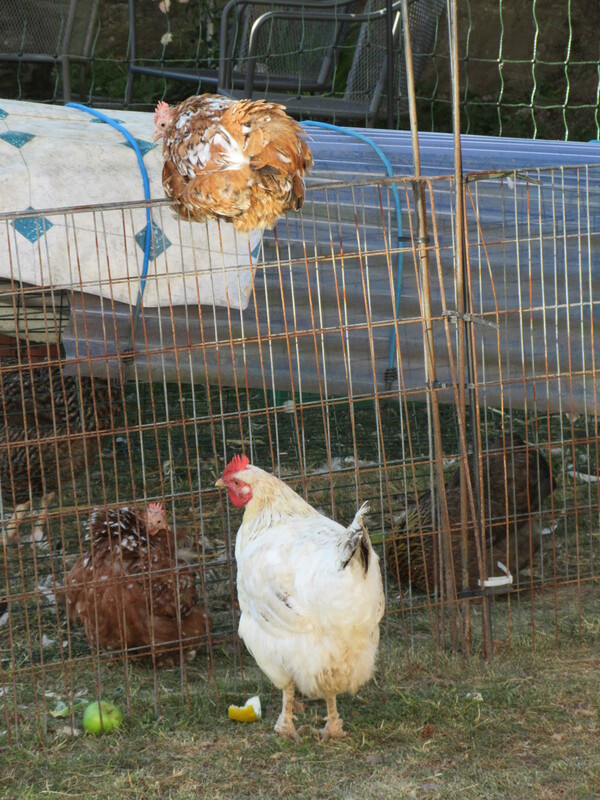 Both sets of ex-batts found their way to bed in unfamiliar surroundings last night The B Team are still a little confused this morning, trying to escape the Hen Run back to their area of the Hen Garden – they’re probably missing the compost heap etc. But one more day and we’ll put them all together, stand back and see what happens. My concern is that, when changing nest boxes and litter trays this morning, I found a puddle of blood in the litter tray of the Cube. It probably wasn’t as much as it looked, having been soaked up by the woodshavings, but it was still rather startling. I’ve looked all the B Team hens over and can’t find any evidence of injury or prolapse? Not even a torn nail. Very puzzling and rather worrying. If it should happen again tonight, it will delay integration while I find out what’s going on, but I’m stumped. Meanwhile, they all seem well, if a little disorientated! I left them together for quite a long time in the afternoon, but wasn’t outdoors much myself to see what went on – I didn’t hear anything very much from the kitchen, so I assume things were mostly peaceful. When I opened the way between the two broods today, the A Team headed straight for the Eglu. I remember reading somewhere that one way of integrating two broods is to swap them into each other’s territory. 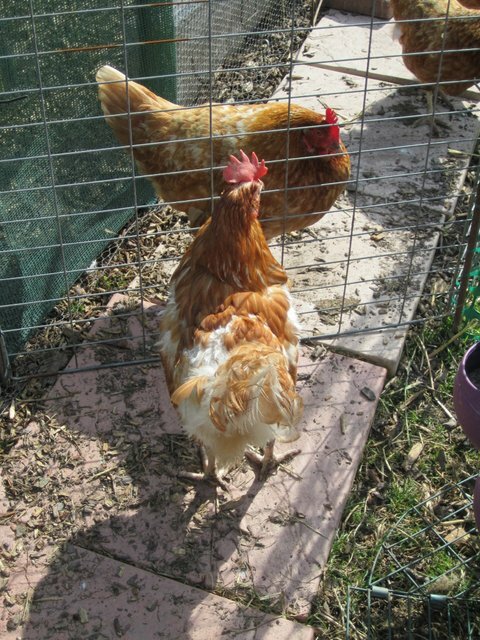 And somewhere else I read that integrations are easier if you are adding a greater number of hens to an existing flock. So without too much hesitation, I shut the Eglu, chased the B Team into the Hen Run, put the fencing in place, and then released the A Team into the Hen Garden. In case you are totally confused, quite simply, the two broods have changed places! 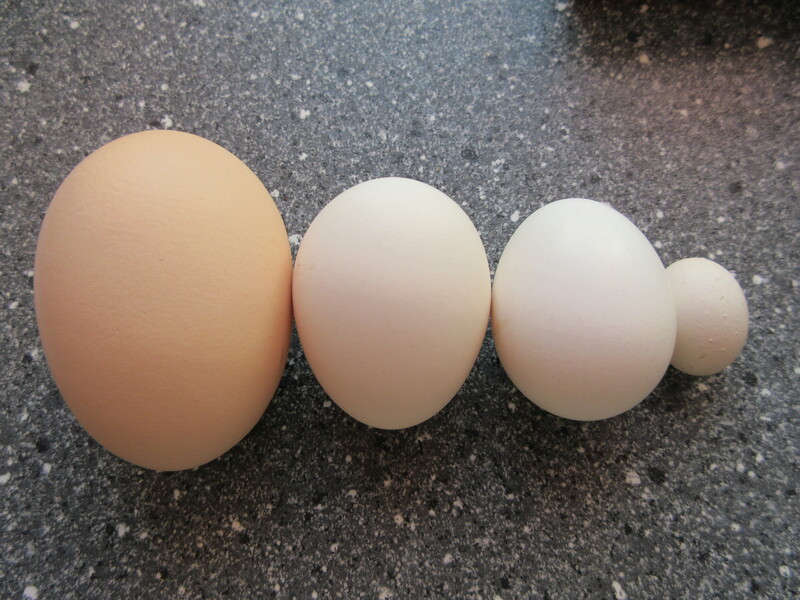 It’s generally a better arrangement, in that there are now three hens in the small Eglu run instead of four. 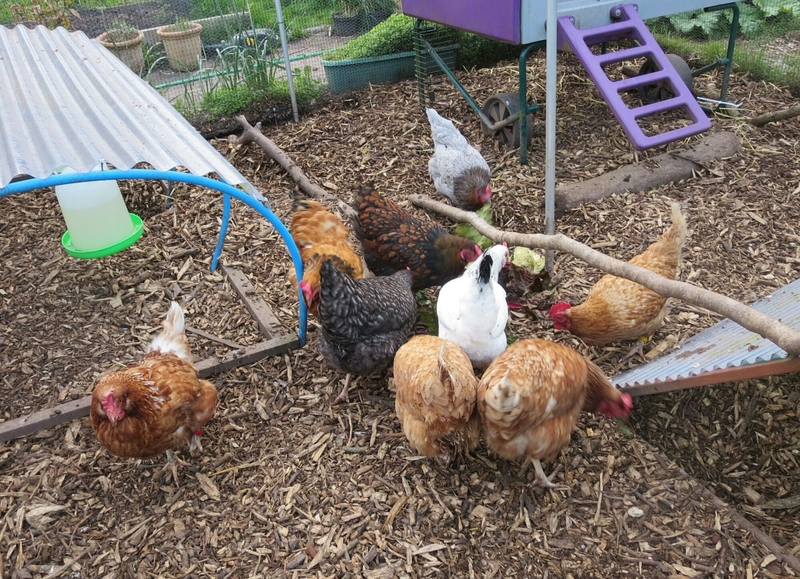 And the B Team can get used to the woodchip of the Hen Run. So there they are, and there they will now stay for a day or two. The A Team meeting to discuss tactics … but they weren’t expecting today’s move! Yesterday evening I opened the way between the two sets of ex-batts … they’ve only been neighbours for a couple of days, so perhaps it was too soon? I stopped filming to interfere and break it up … but watching it over in slow motion, one of the battles was already over, Mandy victorious with a mouthful of feathers and her opponent retreating to the safety of the Eglu It’s hard to watch, but it will eventually ensure peace and harmony, once order is established. The new girls retreat when approached by the established brood … and everyone’s happy. It’s not all done and dusted, there will be other attempts to adjust or enforce the pecking order, but they understand each other, even if we find it hard to watch. One last video, this time with commentary! Shortly after this, I separated them. Enough is enough. We’ll have another go later today. But it was a long, logistical puzzle to get there! First of all we had to find a ‘holding pen’ for the B Team … so I fenced off a small area around the compost bins. Picking up three of the B Team was easy since they crowd around my feet expecting treats! The fourth hen, the one with the largest comb (let’s call her Betsy), won’t come close, so that was a two man job … but she’s not too bright, so it wasn’t difficult. 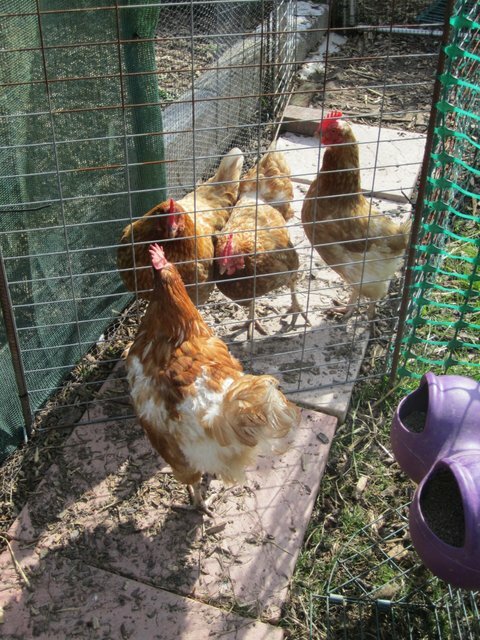 Once that was done, we moved the Eglu, and released the girls from the holding pen into their new space. To allow the A Team to get a better view, I put a wire fence panel across … and stayed to watch what happened next. At first, all three of the A Team crowded out to see what was going on. 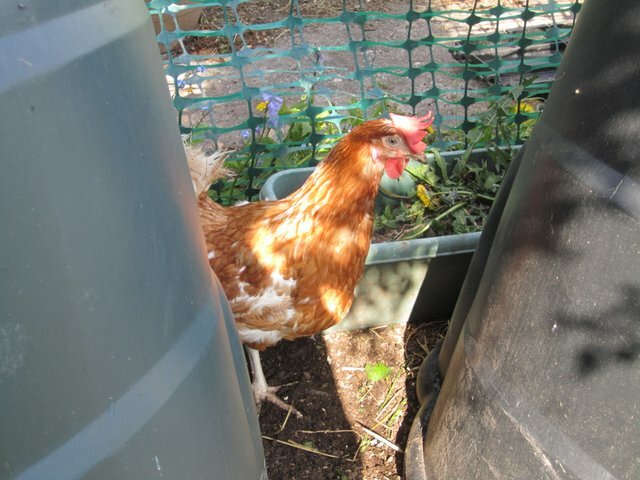 As did the B Team … all except Betsy, who now had the area round the compost bins to herself. I’d like to think it was a conscious choice to stay and take advantage of the situation, but I suspect it was simply that she really didn’t realise what was at stake! There were a few skirmishes, but Bertha kept wandering off – after all, she was the one in new surroundings, with plenty of things to do and eat and places to explore. Molly however, stayed on guard, alert and focussed, and of course, Bertha kept coming back to see if she was still there. … and she soon joined them! With four of them in there they were all soon covered as they were pelted with soil and grass cuttings as the others dug down for slugs and bugs.